Years ago when working in Amsterdam I became interested in Visible Thinking following workshops and presentations at the school where I was working. This weekend I was in Singapore at the IBO offices and over dinner one night I heard about Visible Learning (making the learning visible to the teacher). Professor John Hattie's study is one that involves metadata collected over a 15 year period from over 800 million students. It looked at the effect of various factors on student achievement such as the school, peers, the principal, teachers and so on and came to the conclusion that above all else students provide the key to improving their own performance. The factors that lead to higher achievement are things like self-reported grades and formative evaluation, whereas the things that lead to a lack of achievement are factors such as the summer vacation, television and above all else mobility. The study shows that class sizes, extra curricular activities, ability grouping and homework have very little effect on achievement. I thought this was a pretty interesting finding since almost all the students I've taught over the past 25 years have been from families who are extremely mobile, but also because our intersessions programme has attempted to prevent the "brain drain" over the long summer holidays. I was also interested to read that homework has no impact on achievement (which is something I've long suspected). If your teaching practice is not having an effect on your students' performance, you must change. How does Hattie propose that teachers change? For a start he advocates working more collaboratively and talking about teaching (not about curriculum, assessment and students). Here are a couple of videos where John Hattie explains his findings. The infographic at the top of this post is taken from the Visible Learning website. Hattie's work is incredibly useful in underpinning the work we do, when we take ideas, activities and processes from the creative industries and see whether they stand up in the realm of learning. 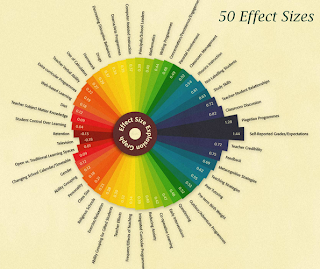 What was surprising at the beginning of this journey for us, was how close the match between creative practices and the top 20 or so effect sizes is. Thanks for sharing - great to see Hattie's work spreading further and further! I agree - it is great to see Hattie's work getting some very deserved and wide recognition. Also for highlighting this vital aspect of teaching and learning - I think amny school admin teams would do well to read this and ask themselves how can I/we help my teachers and students to apply these principles? I am fairly sure they would start by removing unnecessary administrivia from our daily work load. We need to redirect the schools, students and teachers time more effectively towards these sort of outcomes and pracitces. Very interesting blog post - thanks.